Perhaps the most terrifying maritime image is that of the attack of a giant squid upon a boat. Many illustrations have been made showing a humongous squid wrapping its great arms around a ship with the clear intent of sinking it. While it’s likely there has never been a boat sunk by a giant squid, there are squids of a gigantic size... and they have attacked boats. A major goal of marine biologists worldwide is to observe giant squids ― known scientifically as 'Architeuthis' ― in their natural environment. No other animal of their size is so little understood or known... because of this, reports of giant squids from the distant past are cloaked in myth and folklore. For example, it is often noted by authorities that the earliest known mention of a giant squid was by Pliny the Elder [23-79 CE], Roman author of the thirty-eight volume Natural History, who noted a specimen that weighed around 700 pounds and had tentacles thirty feet long, which is impressive. What tends to not be mentioned by these authorities, however, is that Pliny also tells how this squid was habitually coming out of the ocean to steal salted fish set out to dry; and Pliny even claimed that the squid climbed a tree to get past spikes put in its way, and that it was finally killed by a group of men in a fierce battle on land. So Pliny’s squid is not a valid report of an actual giant squid; it's just the first known mention of the animal. Other attempts to find ancient tales of the giant squid have led to mis-identifications, such as equating the giant squid with the legendary beast of Norway called the “kraken.” This identification was partly accidental and partially purposeful; but the arguments for the two creatures being one and the same is very questionable. So again, these are not valid reports of giant squids despite how often modern movies and stories use the name "kraken" to mean that. The best actual evidence for the existence of the giant squid are carcasses of the animal that washed ashore on the beaches of Newfoundland in the 1880’s, one of which was 55 feet long... but many people believed the squids could get much larger. This belief came from examinations made of the skin of sperm whales, which eat giant squids. Almost all sperm whales sport large circular scars left by squid tentacles; this is because a squid’s tentacles are covered by suction cups that also have claws in them, which can tear a circular chunk of skin out of anything the squid grabs. Based on the size of these sucker marks, some estimates claim giant squids can grow to be between 160 and 246 feet long! But don’t panic; these calculations forgot that if a whale received a scar while young, the circular mark continues to grow as the whale does... making the final scar much larger than what a giant squid might actually leave. Most scientists who study the giant squid now stick to the more reasonable estimate of 60 feet for its greatest size. These monstrous squids are rarely seen because they dwell near the bottom of the ocean; but they do sometimes come to the surface. On the day of October 26, 1873, a fisherman named Theophilus Picot was off the southeastern tip of Newfoundland when he saw a large object, bigger than his boat, floating in the water. Curious, he rowed closer and poked it with a boat hook... and the giant squid sprang to life, attacking his boat. Picot fought to escape; when he managed to hack off a tentacle with an axe, the squid quickly swam away leaving the sea black with ink. Based on both Picot’s observations of the squid and the size of the severed tentacle (nineteen feet! ), the squid was estimated to have been around sixty feet long. Finding a squid motionless at the surface of the ocean is very unusual behavior for the animal, unless it is already wounded or dying. The squid didn’t attack until Picot poked it; so the beast may have felt it was attacked first, and simply defended itself... but there is a recorded case of a claimed direct attack by a squid. In 1942 Lt. R.E. Grimani Cox and twelve other sailors were on a life-raft in the ocean after their ship was sunk by a German raider. For days they were harassed by sharks; but on the fifth day, these left for no apparent reason. shortly thereafter, a large dark mass appeared in the water under the raft... then a tentacle reached out of the sea and snatched a man off. Shortly after, another tentacle wrapped around Cox; luckily, his shipmates grabbed him. The tentacle tore him with its toothy suckers, leaving Cox with inch-and-a-quarter circular scars on his right leg and body. During its maiden voyage in 1970, the USS Stein had a sudden failure of its anti-submarine sonar equipment. When the ship put in for repairs, it was discovered that the rubber skin over the sonar was covered by scratches, the longest being four feet in length. At the bottom of each scratch was found an enormous claw, similar to those in a small squid’s suction cups... but much larger. Why a giant squid attacked the ship is still unknown. In 2003, the French vessel Geronimo was temporarily slowed while participating in the “Jules Verne Trophy” race when a giant squid grabbed the boat just off the coast of the Portuguese island of Madeira; alarmed, the crew brought the boat to a stop, while wondering how they were going to fight the squid off. Luckily, once the boat stopped, the squid let go and swam away. It was estimated to be about eight meters long (around twenty-six feet); unfortunately, no one took a picture of the squid. These surface attacks are rare and likely due to the giant squids mistaking ships for either a predator to be fought or prey to be eaten. As humans travel deeper into the oceans of the world, and encroach into the hunting grounds of these beasts, these attacks may become more frequent... let’s hope the squids don’t develop a taste for the human invaders! Arthur C. Clarke’s Mysterious World, by Simon Welfare & John Fairley, intro by Arthur C. Clarke, 1981 A & W Visual library, New York, NY, USA. ISBN: 0-89104-268-7 pg. 71-77. Online [snippet view]: Click here! "Monsters of the Deep," episode of Arthur C. Clarke’s Mysterious World, TV Series, first air date: September 9 1980, Yorkshire Televsion, England. "Destroyers Online: USS Stein," article in the Destroyers Online website, posted 2008. Online: Click here! “Giant Squid ‘attacks French boat’,” article in the BBC News: World Edition website, posted Jan 15, 2003. Online: Click here! “Giant Squid slows Geronimo,” article in the CNN.Com website, Jan 15, 2003. Online: Click here! Histoire naturelle, générale et particulière, des mollusques, by Pierre Denys de Montfort, 1801 Defart, France. Online [in French]: Click here! The Natural History of Pliny, Vol. I, translated by John Bostock and H.T. Riley, 1887 London, England. Pgs. vii-viii. Online: Click here! The Natural History of Pliny, Vol. II, translated by John Bostock and H.T. Riley, 1890 London, England. Pgs. 419-422 (Book IX, Chapter 48.). Online: Click here! Kingdom of the Octopus: The Life History of the Cephalopoda, by Frank Walter Lane, 1960 Sheridan House. pg. 196-197. “Marvels in Marine Natural History,” in The Eclectic Magazine of Foreign Literature, Scienec, and Art, August 1846, New York: Leavitt, Trow & Company. pg. 554-557. 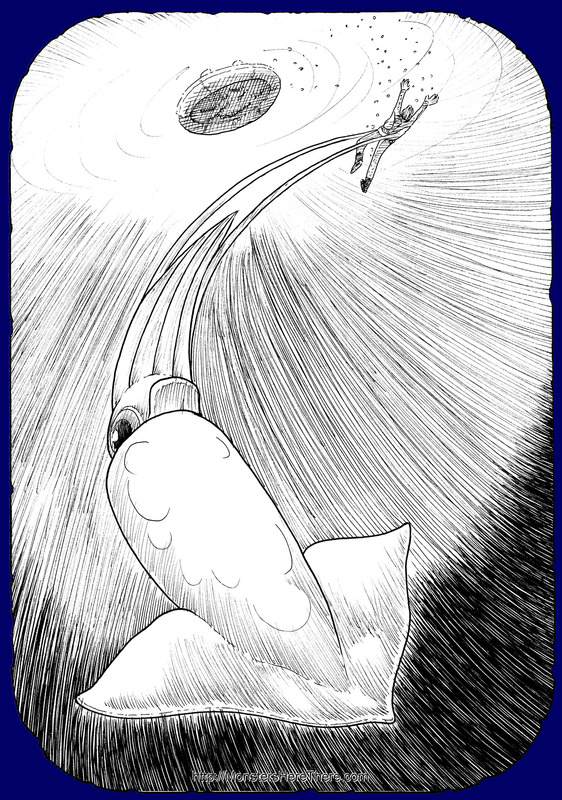 [Pliny's squid] Online: Click here! Proceedings of the Boston Society of Natural History, Vol. XVI, 1873-1874, Letter from Alex Murray, 1873, pg. 161-163. Online: Click here!